Ancient Egyptian gods and goddesses usually wore masks in the shape of birds (ascension) and cats or lions. Most of the masks were metaphors for creation ---> destruction--->rebirth as our consciousness moves from one reality - experience - to another. There is only one soul behind the creation of these mythological gods and goddesses - who can be found in the creational legends of all cultures. The Goddess Bast - Bast is the Egyptian Goddess and protector of cats, women and children. She is Goddess of sunrise. Her goddess duty changed over the years, but, she is also known as a goddess of love, fertility, birth, music and dance. Bastet is a cat-headed goddess, a local deity of the delta. 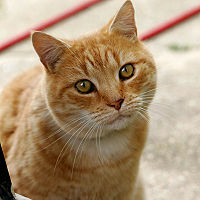 Cats were sacred to Bast as a symbol of animal passion. Bast's devotees celebrated their lady with processions of flower-laden barges and orgiastic ceremonies. Her festivals were licentious and quite popular. The God Bes - Dwarf lion God of luck and fortune, Bes was much favored by women in Ancient Egypt. He was associated with childbirth and the home. Bes is most often shown as a dancing grotesque, with his tongue protruding and a strange half lion, half mask-like face. He wears a lion skin with the tail dangling down behind him, and often a tall crown of feathers. The Goddess Mafdet - This Goddess prevails over snakes and scorpions. She is probably one of the earliest feline deities and was either a cheetah, a lynx or a leopard. She was described as having plaited hair, which was said to represent the linked bodies of the scorpions she killed. As of yet, we know little of Mafdet, other than what we've learned subjectively through visualizations. Her name has been said to mean 'runner', which does suggest a link with the cheetah, the fastest of felines. The Goddess Mut - A widely-worshipped mother Goddess, Mut is yet another deity who can have a fully human or lioness-headed form. She was the consort of Amun-Ra and the mother of the moon god, Khonsu. Apart from the cat and the lion, her other sacred animal was the vulture. The Goddess Neith - A mother of the Gods, Neith was most often seen as a fully human woman, sometimes holding a bow and arrows. However, she did have a lioness-headed aspect. Neith is unusual in that she has a androgynous aspect, in that she was supposed to have self-generated and to have both male and female elements in her nature. The Goddess Pakhet - A lioness-headed goddess, Pakhet is virtually unknown in comparison to Bast and Sekhmet, but she was a major goddess in her own right. As Bast's region was Lower Egypt and Sekhmet's Upper Egypt, Pakhet was worshipped in Middle Egypt, and had a temple which was cut out of the solid rock near the modern day village of Beni Hasan in the eastern desert. Like Sekhmet, she was seen as something of a ferocious Goddess, for her name means 'the tearer' or 'she who snatches'. The Goddess Sekhmet - A lion-headed goddess of war and battle of Memphis. She is the power that protects the good and annihilates the wicked. Sekhmet is the wrathful form of Hathor (goddess of joy, music, dance, sexual love, pregnancy and birth). With leonine head, female human body and the strength of her father, she is the noontime sun - intense blinding heat. Sekhmet is the triad goddess of Memphis with her husband Ptah, god of arts and crafts. Nefertum was their son and the third member of the triad. Ptah is the creative potter-god who shaped the world and heavens assisted by the seven wise worker-dwarfs of Khnemu. The Goddess Tefnut - Tefnut, along with her twin brother Shu, were the first Gods to be created by Atum or Ra. Tefnut personified moisture, and Shu personified the sky. They had two children, Geb, the earth, and Nut, the sky. In this way, air and moisture, earth and sky were created in sequence. Once these elements came together the physical world came into being. 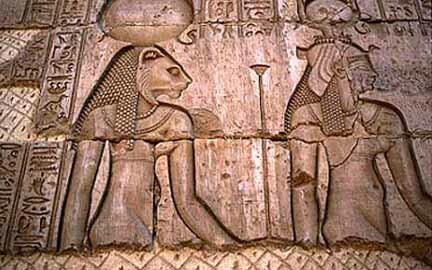 Tefnut is often depicted in human form but also has a lioness-headed aspect. Like Sekhmet, Bast and Hathor, she is known as an Eye of Ra.